On Thursday, April 15th, I stopped over at the Sebastian and NYLON event at the Antonio Prieto Salon. With my cocktail dress attire on and makeup done, I was almost ready to attend the Zac Posen for Target launch party except for my hair which was tied back in a ponytail. Nick Antiaris, Principal Stylist, saved my hair for the night - thank you Nick! He curled and styled my hair, making it look amazing. I was so impressed - the curls lasted all night, and I got a ton of compliments on it. If you are looking for a stylist - definitely see Nick! Take a look at my post on the Zac Posen for Target Launch Party to see how my hair turned out! I really liked the Sebastian Trilliant Nick used on my hair, for heat protection, body and shine and Sebastian Shaper Zero Gravity ultra-lightweight hairspray. 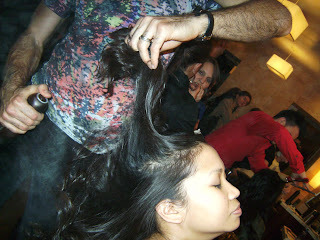 Next up, Nick blowed out my friend Lisa's (BeautybyBenz) hair. While Lisa was getting her hair done, I enjoyed some appetizers - mini baked potatoes topped with caviar, salami with olives and fruit kebabs. The gift bag included Sebastian Volupt volume boosting shampoo and conditioner samples, which I'll have to try (I'm all for volume-boosting on my hair) and $30 off my next salon visit to Antonio Prieto Salon. I am definitely going to have to try a haircut with Nick next!